TGIF!! Am I right, or am I right? And if you live anywhere near the Pacific Northwest, you know it’s been a nice week, and it is time to finally take advantage of it! Tonight my husband and I are planning to take our pup (well, 13 year old man) to the dog beach nearby. I used to take him there all the time (before I moved out of state) but have not taken him there since I’ve returned, and I’m not sure if my husband’s ever been there. I hope that everyone reading this has fun weekend plans, also! The above picture is what dinner at my mom’s looked like a few weeks ago. 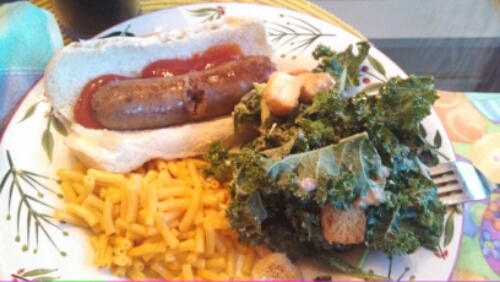 Hot dogs, Kraft macaroni, and kale and spinach salad: YUM! 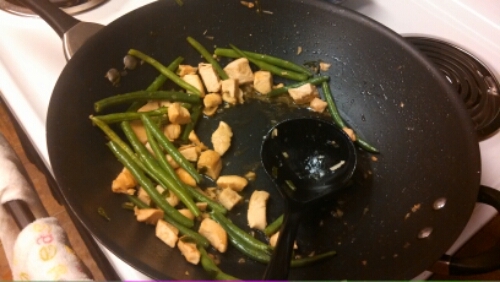 The chicken and asparagus green bean stir fry from Gimme Some Oven that I’m sharing with you today is a definite win. First of all, it is hard to go wrong when making something from Gimme Some Oven’s blog! Second of all, it’s simple, light, and tasty. I used green beans instead of asparagus, since the asparagus at the store looked nasty and shriveled, and I prefer green beans anyway. 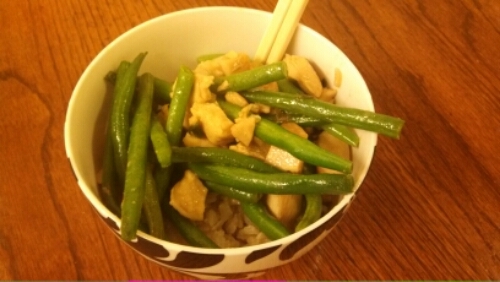 In fact, I haven’t used fresh green beans in months, so it was nice to include! I’m also pretty sure that I added extra soy sauce during the cooking process, because I felt like it was lacking a little bit. 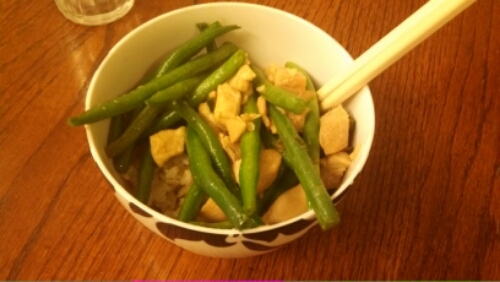 -In a small bowl or in a ziplock bag, combine soy sauce and honey. Add chicken, and stir to coat. Set in the refrigerator until ready (I like to marinate as long as possible). -Meanwhile, heat oil in a large skillet over medium-high heat. Add asparagus, and saute until cooked, about 5 minutes. Remove the asparagus and set aside. -Remove chicken from marinade, and add to skillet. Saute until nearly cooked through (with the insides still slightly pink), about 5 minutes. Then add garlic, scallions, and the reserved marinade to the pan. Saute for an additional 2 minutes until the chicken is cooked and the garlic is fragrant. Mix the asparagus back in, then remove from heat and stir in sesame oil. -Serve immediately with rice, garnished with toasted sesame seeds if desired.